New York: Doubleday & McClure Co. , 1900. Leather bound. Very good. Octavo, 388pp. Gilt title on spine and raised bands. Gilt top leafs. Half morocco with marbled end papers. Frontispiece engraved portrait of McKinley. Front marbled end paper is cracking, but attached. Interior pages are in fine condition. Custom made clamshell presentation box. Inscribed on front free end paper: "For Charlemagne Tower. With Cordial Regards. July 31/900. 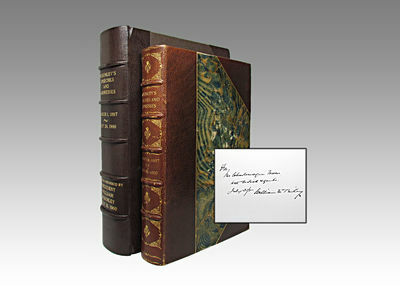 William McKinley" Inscribed to Mr. Tower while President McKinley was in office. At the time of this inscription, Charlemagne Tower was the United States Ambassador to Russia. He would go on to be the Ambassador to Germany, successful business man and benefactor to the University of Pennsylvania.